Sometimes you just need something crunchy and savory. It’s tempting to reach for tortilla or potato chips, but with this recipe you’ll never desire to again! Here we quickly slice mushrooms (I buy from Costco) in a food processor, toss them with seasonings, and then dehydrate them to crispy crunchy perfection. Even the kids love them! The texture totally changes, and the mild mushroom flavor is perfect complement to so many savory flavor combinations. If you’re feeling adventurous, mix up some of your favorite herb combinations and try them out. Below I have some suggestions that we’ve loved. 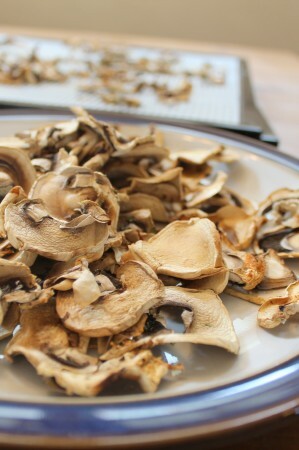 Trim the end off the mushroom stems if desired, but keep the stems attached. 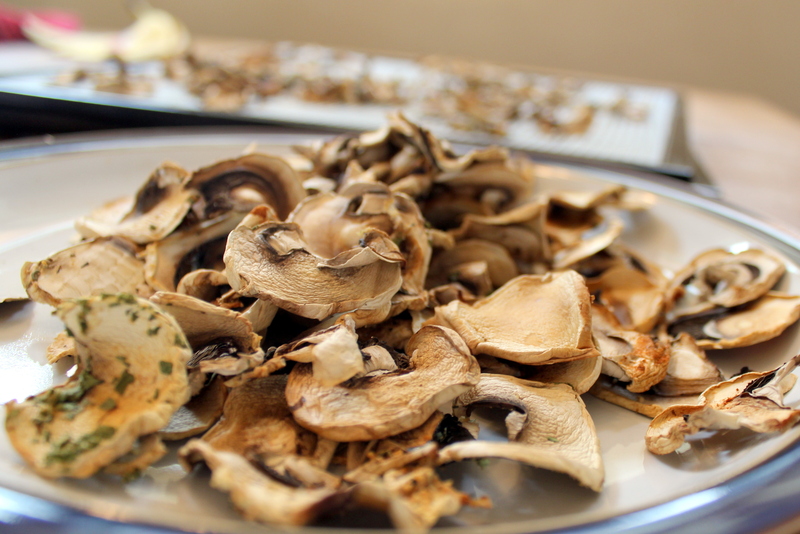 Use a food processor with a slicing blade or a knife to slice mushrooms into thin slices, about 1/8th inch thick. Place mushroom slices in a large bowl. Top with lemon juice, sea salt, powdered garlic, and parsley. Use your hands to gently toss to distribute the seasoning evenly without breaking up the mushrooms. Place a dehydrator tray (I use this kind) over the sink and then use a large spoon, or just gently scoop from the bowl, about half the seasoned mushrooms. Spread evenly over the dehydrator tray, they can be touching but shouldn’t be piled to allow for even air distribution. Repeat with the other half of the mushrooms. Dehydrate on high for 4-6 hours, or until crisp. Serve, or keep in an air tight container once cooled. 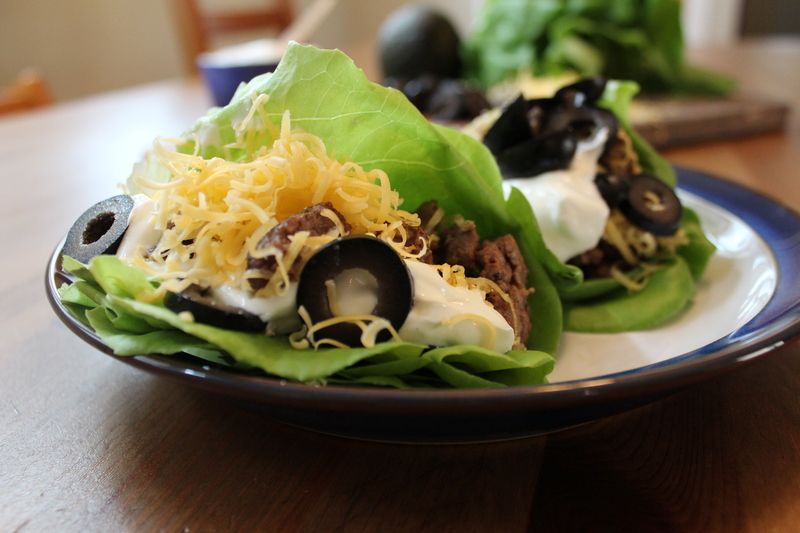 These are delicious with Creamy Dairy Free Spinach-Artichoke Dip! This is part of my Dehydrator Recipes post – check out dozens more here. Already know that you want it? Purchase right now by clicking here for a special discount – only $10/month! Hurry! This offer won’t last long! I’ve never thought of mushroom chips. We’ll definitely give this a try!